Have you heard about Affiliate marketing? If you have and are just starting out being an affiliate in India, this post will give you a complete overview of affiliate marketing landscape in India. But first, let us understand what is Affiliate Marketing – The business of marketing third party products on your website, and being recompensed for each purchase, sale, click or revenue generated by visitors who have reached the Seller through your advertisements, vouchers or other incentives on your website, is generally known as ‘Affiliate Marketing’. Who Offers Affiliate Marketing in India? 1 How is Affiliate Marketing done? Merchants assign a fixed commission to the ‘link’ or ‘banner’ of the products that they offer online. The affiliates understand the terms they are offered and publish the link or banner on their website, blog etc. and the link tracks all the traffic and sales generated through each affiliate as the link/ URL given to each affiliate is unique. 1.) Affiliate Networks offer services for facilitating affiliate marketing. They provide a network for ‘Advertisers’ / merchants as well as ‘Publishers’ / marketers. When a customer clicks on the link available on an affiliate’s website, a cookie is set on the visitor’s browser that identifies the advertiser, the publisher, and the specific link and payment rates. When the visitor makes an actual purchase online or fills out a form, that transaction is tracked and recorded by concerned network. After recording the transaction, it handles all of the collection and processing required to ensure fair and timely commission payment for the publisher, and all of the administration and verification necessary to ensure quality sales and leads for the advertiser. Here the cookie is active for 30 days, therefore in the event that the visitor goes to the merchant’s website within 30 days of first activating the cookie, the affiliate will get paid for any sale (and multiple sales) occurring within those 30 days. Some affiliate networks use a combination of html ‘end of sale’ code (which is placed in your shopping cart or on your ‘order confirmation’/’thank you’ page) and cookies (which are created on the customers PC after they click on one of your advertisements) to track sales. This ‘two key’ combination ensures that network will ONLY track the sales that are sent to you from that network’s affiliates. Cookies are deleted once a transaction occurs or typically expire within ninety days. The life of the cookie can be set to 45, 60, 90, 120, 150 days, 1 year, 2 year or indefinitely. Sites like CouponzGuru, Pennyful, CouponsDuniya and Cashkaro, as the same suggests, provide coupons to customers and cash back options that may be used while making a purchase on any merchant site, having reached the said merchant site after perusing and clicking on the relevant coupon/ offer at the above-noted affiliate websites. There are others like Groupon and mydala which offer coupons and discounts at offline entities like restaurants, gyms, grocery stores, health and beauty stores in addition to the online deals at ecommerce merchant sites. 2.) Ecommerce portals in India are offering their own affiliate programs also, such as Flipkart, Jabong, Snapdeal Amazon Associates and so on offer their respective affiliates up to 15% for each successful referral (which ends in purchase). Websites can place banners or links re-directing visitors to products on these sites. CPM or ‘Cost per 1000 impressions’ – This is the value paid by the merchant to the affiliate for every 1000 page views of text, banner, images. CPS or ‘Cost per sale’ – This is the amount paid by the merchant to the affiliate on an actual purchase/ transaction made by the visitor. CPL or ‘Cost per lead’ – The amount paid by the merchant to the affiliate when a visitor leaves personal information such as name, email ID etc., allowing the merchant to get in touch with such visitor. CPC or ‘Cost per click’ – The value paid by the merchant to the affiliate for each click on the advertisement, text, banner. CPA or ‘Cost per acquisition’ – The value paid by the merchant for an action, such as filing up a form, signing up for something etc. Affiliates can indulge in misleading the number of visitors / clicks etc. in an attempt to get higher commissions from merchants. An Affiliate may offer discounts and offers on a product or service which is entirely untrue or exaggerated to the extent of being impossible to deliver, which may lead to loss of customers for the merchant. Merchants may promise high commission in the beginning, only to reduce the commission rates or percentages with time. Link hijackers may hijack affiliate links and direct the payment of commission to themselves. Merchants may suffer a gradual decline in profits, as consumers who would have visited their website directly may only now shop/ purview their products through the affiliate’s website, meaning thereby that what would have been a direct sale, becomes a sale for which the merchant will now have to pay a commission. Although it may be at its nascent stages in India, the advantages of affiliate marketing, its low cost and high benefit for both merchants and affiliates, the slowly growing number of service providers offering their expertise for setting up affiliate marketing programs, software and network, increase in internet penetration in India, the growing craze and convenience of ecommerce companies – all factors go to show that Affiliate Marketing (when embarked upon after carrying out due diligence by both merchants and affiliates) will only earn more beneficiaries with the time to come. Affiliate Marketing is the most cost effective and viral channel of marketing for E-Commerce companies. They just pay for the transactions that the affiliates brings, unlike other channels where they need to pay for each view or click irrespective of the transactions. Above all, advertisers indirectly get a lot of exposure to the affiliate’s marketing activities at various channels as affiliates pushing the advertiser’s content to generate more sales. Also each affiliate has his / her own set of ideas and thus I call affiliate marketing as one most effective “crowd” sourced method of marketing. Thanks for sharing this interesting resource on the affiliate marketing landscape in India. I’m still not too sure whether its still a viable option or what the timeline is for new marketers to start generating some sort of viable income from affiliate marketing. Are there any new affiliate marketers who have managed to start earning money? Affiliate marketing has now become an important phenomena for businesses. Among the small businesses it is booming because for the promotion of products of small business. Its sad to say that although their is a startup boom in India, there are very few Indian Companies promoting their products through affiliate marketing. Affiliate Marketing is very popular in the west but still at its nascent stage in India. 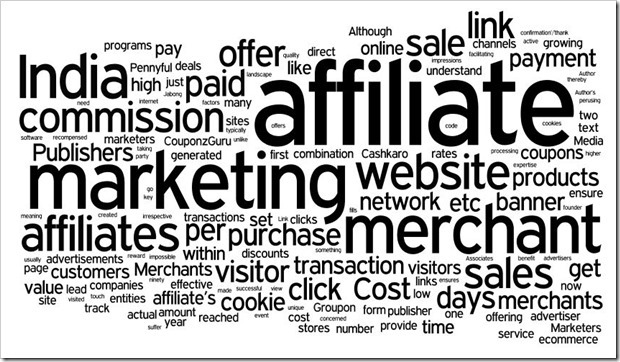 Hi, vikash, it isa good introductory article on affiliate marketing. I am looking forward to a affiliate network working in India with good payment history. But. Could not find one. Can you suggest me some..? I have one query.. to start such website do we required goverment approvals or service tax number? hey vikash i have a query . just take eg i make post on facebook through which customers go to the flipkart amazon or any other e commerce website , now is it under affiliate marketing ? if it is then how its work ? Yes you can use facebook also as a affiliate marketing channel. Just make sure the link posted on FB has your affiliate tracking parameters appended. Thanks for posting this blog. These kinds of blogs help people in getting aware about affiliate marketing and thereby understanding how to make use of online deals and offers. I am a failure in Affiliate Marketing. I tried to work with clickbank. But failed badly. But I wont give up. Please give me some ideas to succeed brother. I need your help. same experience with palamit.com… i am so happy working with palamit.com.. customer service is awesome. why haven’t i received answer for my query………thats the problem with affilliate sector in india…….u guys think of everybody else as dumb and when someone asks a pertinent question……u push it under wraps……why…..because it will release ur trade secrets…..nobody in india is ready to work on honest and predefined terms……no wonder most indian afilliate marketers are banned on global affillaite networks because of their shady,fraudulant and gimmicky practices. are there any good entities or websites in india which handles the complete affairs of affilliate marketing…..?like when big portals like yatra.com need sales,they turn to tyroo,dgm etc who then turn to their network of publishers to do the job and take commissions from the portals and then pays the publishers,but are there any enterprises in india who takes in individuals (who think of this a good business preposition) as their publishers,manage their whole caimpaignes,set up their websites,drive traffic to the sites,close sales and charge them a commission for sales.this would not be deemed unethical i guess…….because the merchant still gets its sales,the network also makes money and the investor/publisher also makes great returns…….. i mean a person with 10 lakhs rupees to invest can earn a decent amount in four months in which his website is created, advertised and optimized by professionals with their tracking softwares ,tools and stuff. don’t you think advertising portals are making a mistake by ignoring this section of investors…..? i mean high returns in affilliate marketing are greater than even real estate in short run…….does anybody in india with good track record do it……..? This is a good summary of affiliate marketing in India. Interested people will certainly get a basic understanding of aff marketing. Congrats to you on starting the Sg branch :) I hope it works as well as the IN one. Thanks Chitra :) Glad you liked it. I have a small query… How do sites like cashkaro and pennyful help websites like Amazon or snapdeal. I mean I visit cashkaro AFTER I have decided to buy from Amazon. So Amazon is unnecessarily paying cashkaro even though they were not the reason for my visit. Now think of a situation, wherein, you din’t visit Amazon, Flipkart, Snapdeal, Myntra, Jabong etc on a particular day. However, you visited any coupons or cashback site that day and you get to see an exciting offer running on Amazon or any other e-com site listed at that coupons / cashback site. You were not aware of that offer, but coupons site made you aware of that offer. So, you went ahead to Amazon and bought something under that offer. This is how affiliate websites helps merchants (amazon, flipkart etc) to gain more exposure and thus sales.